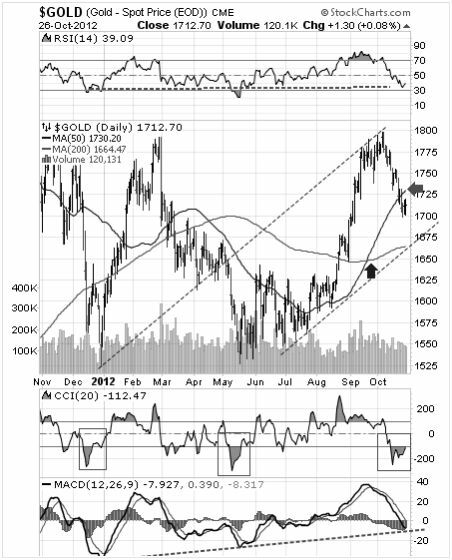 In this essay we draw your attention to another pattern that recently occurred on the gold charts, for only the fourth time in the past seven years. Each time it appeared during the past seven years, it precluded a strong advance. The pattern is called: ‘Golden Cross’, or ‘Bull Cross’. Here is a chart (all charts courtesy Stockcharts.com unless specified), that has a blue arrow pointing to the pattern we are referring to. 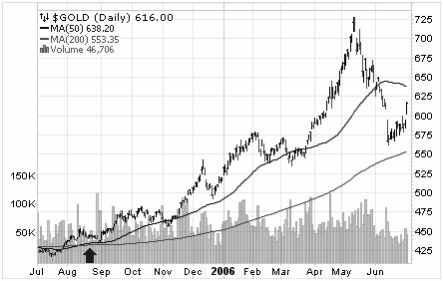 During August of 2005 the 50DMA crossed over the 200DMA for a ‘Bull Cross’. Gold was trading at $435. 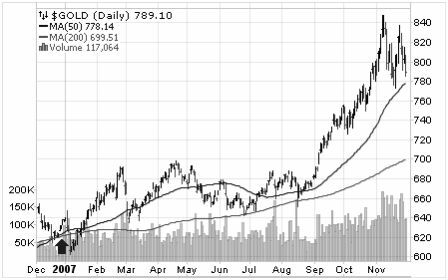 Nine months later gold reached $725. During December 2006, gold once again produced a ‘Bull Cross’. Gold was trading at $625. Eleven months later gold reached $850. 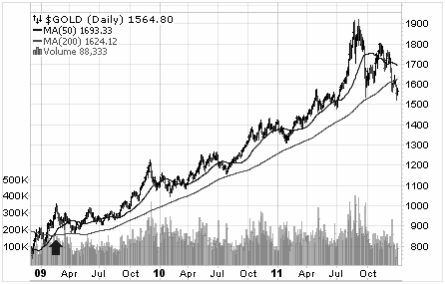 During March 2009, gold again carved out a ‘Bull Cross’. Gold was trading at $900. 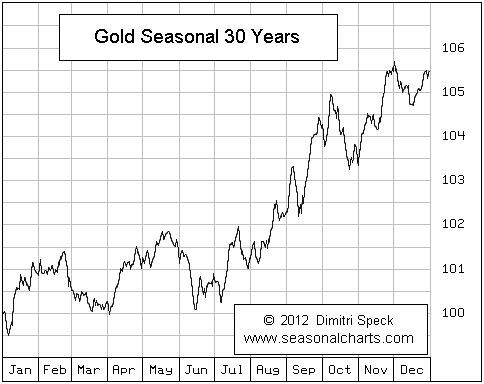 Thirty months later gold topped out at $1920. 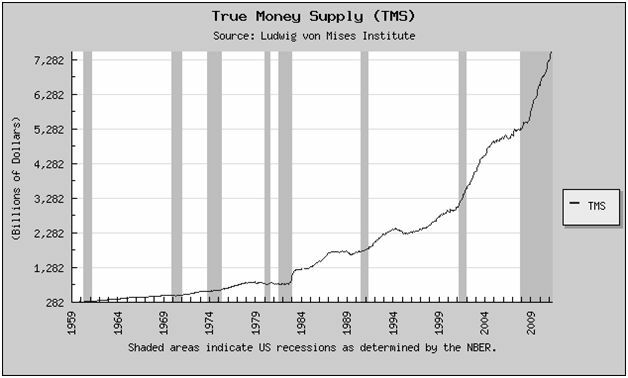 This chart courtesy Mises.org shows the U.S. money supply is rising exponentially.The grey bars indicate a recession is underway. The Obama recession is now the longest recession since the Great Depression. As long as the recession continues, the money supply can be expected to rise since politicians cannot seem to stop spending. 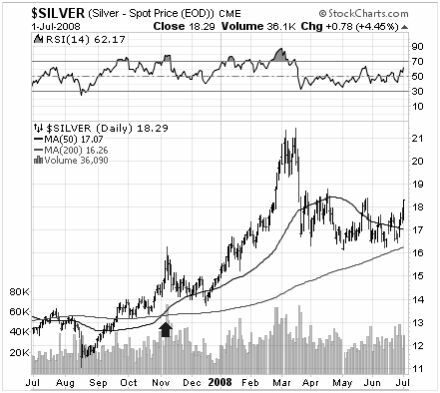 Featured is the daily silver chart from 2005 – 2006. Notice how the 50DMA rose above the 200DMA as it produced a ‘Bull Cross’. 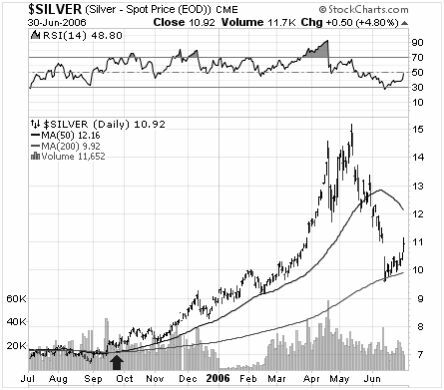 The rally that followed moved silver from 7.50 to 15.25, for a 100% increase. 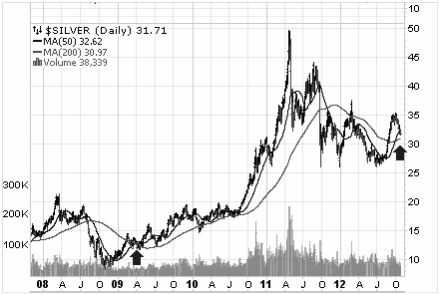 This silver bar chart shows the next time price produced a ‘Bull Cross’ (in April of 2009). Price rose during the subsequent rally from 14.00 to 49.50, for an increase of 250%. At the right of the chart you can see where price is just now completing its latest ‘Bull Cross’. For a close up look we present the next chart. 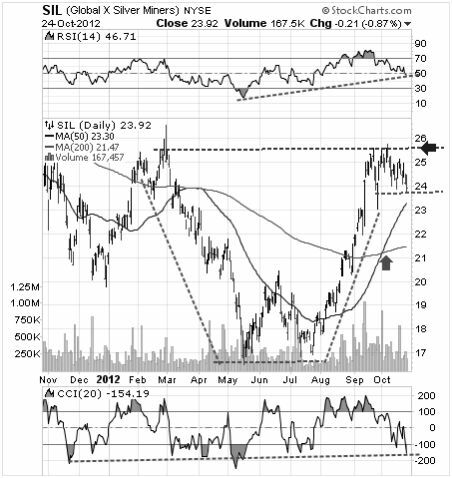 At the same time SIL, the silver producers ETF is carving out a bullish ‘cup with handle’ formation. A breakout at the blue arrow will be the trigger for the next rally. The green arrow points to the by now familiar ‘Bull Cross’. 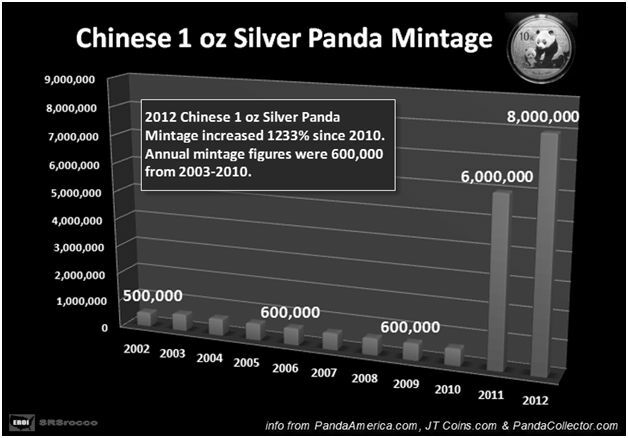 This chart courtesy SRSrocco and Silverdoctors.com shows a dramatic increase in the number of Chinese 1 ounce silver Panda coins. Every Panda removes an ounce of silver from the market. 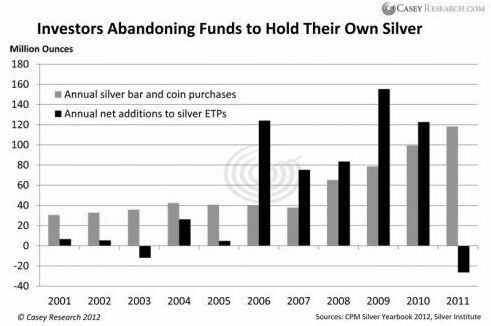 This chart courtesy Casey Research, (based on information from the CPM Yearbook), shows silver investors moving out of ‘paper silver’ and ‘digital silver’ (black bars), into physical silver (orange bars). 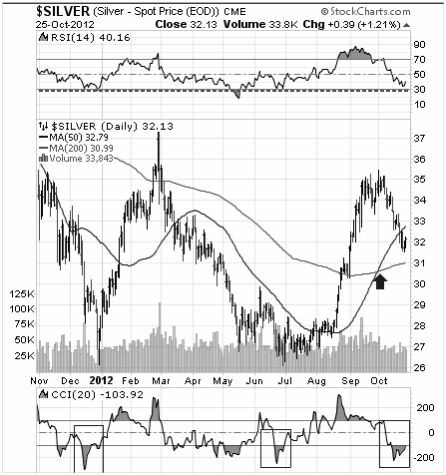 As more and more investors opt for physical silver, this trend will make it increasingly difficult for traders in ‘digital silver’ to dictate the price at which physical silver is bought and sold. Finally – one last chart!